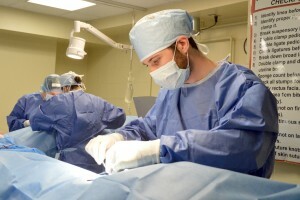 The Luke and Lily Lerner Spay/Neuter Clinic at Cummings School of Veterinary Medicine provides students surgical training while serving pets in need. The mission is to instruct veterinary students in the best practices of small-animal sterilization surgeries, to collaborate with shelters to meed community needs for low-cost services, and to provide the surgical training component for the Tufts Shelter Medicine Program. “The clinic offers our students valuable opportunities to interact with pet owners, to palpate an abdomen, to give an inject,” says Dr. Emily McCobb, V00, VG02, direct of the Shelter Medicine Program. “You can see the light bulb go off over their heads. I can’t overstate the impact as a teaching experience. It gives them a chance to put into practice all they have been learning in their coursework. Jessica Brown, V13, and Kim-Khanh Tran, V14, work on the tech crew at the clinic, cleaning instruments, preparing surgical packs, giving vaccines, and implanting microchips in dogs and cats. 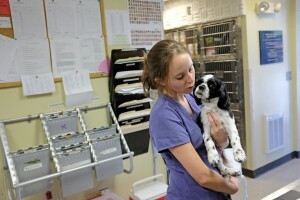 As second- and first-year students, respectively, they do not yet perform surgery, but they provide valuable assistance when procedures are done on animals from area shelters and pets belonging to low-income owners. 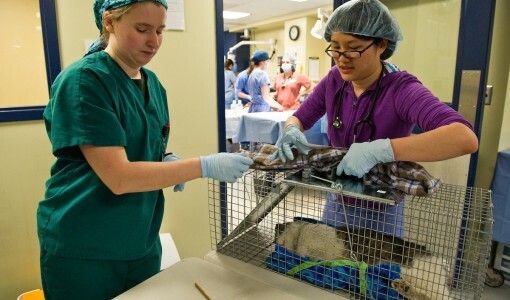 The students also help at the once-a-month Feral Cat Spay/Neuter Clinic for felines trapped in Worcester, to be spayed or neutered, inoculated, then released again. “It can be a very high-stress environment, but I find work to be very cathartic,” says Brown, a Rhode Island native who thought about getting a Ph.D. in socio-linguistics, but then took a job at a Providence veterinary clinic for cats and loved it. The owner of two cats and a dog, all adopted shelter animals, she hopes to go into feline practice. Tran, originally from Los Angeles, an aspiring wildlife veterinarian, says she values her interactions with the animals at the clinic. This story originally appeared in the Spring 2011 issue of Blueprint.